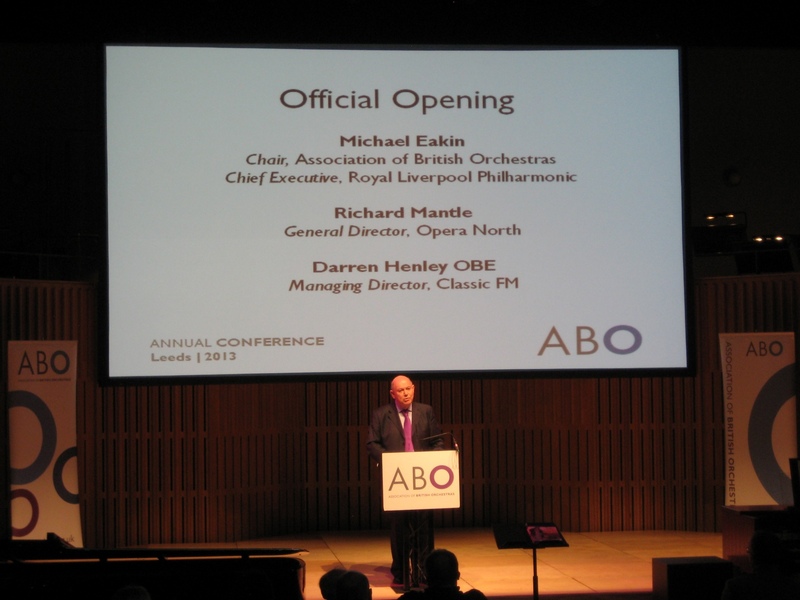 It has been a very interesting opening of the annual conference of the Association of British Orchestras (ABO) in the Grand Theatre Leeds (UK) on January 23, 2013. Dan Jarvis (MP), shadow minister of culture from the Labour Party in his keynote complained about the government cuts in the arts sector from 2012. Arts councils have lost some 30 percent of their money. Cultural and music education in schools is still shrinking. The importance of cultural education for the economy and society is underestimated by most politicians. This has to be changed. The development of culture institutions have been the key to city-center-refurbishment in many UK cities during the past 20 years. The importance cultural issues have to be put more into the common discussion, Jarvis pointed out. Max Hole, chairman and CEO of the Universal Music Group Int., talked on the issue “How I learned to love classical music but fear for its future”. He highlighted that the massive losses of vinyl, cassette and CD sales during the last 20 years have not been compensated by digital sales, streaming and downloads yet. But the development of digital media and of the internet offers great opportunities for the industry. Spotify as a legal platform has got some 18 million users, of whom one third pay for downloads. The count of users has doubled in only one year. For example the recording market in Sweden has grown about 14 percent in 2012, Hole argued. This development shows the huge potential of the market. The record companies will stay relevant for the whole industry, the artists and the audiences with diverse and special services. The quality of services at least does fight internet piracy by quality, too. The way of listening to music is changing drastically due to the boom of mobile devices. But the music industry is not yet making the best of it. There are many best practice examples how to build better links to the audience. Especially the social web gives the unique opportunity to bring listeners and fans of an artist and the different products (recordings, performances, ticket sales, “likes” and recommendations to friends) together. Industry tries to develop this potential with new platforms as http://www.sinfini.com, which is an online magazine as well as a shop. In this context the use of new Apps get important, too. Hole continued to say that the word “classical” still scares potential audiences. Great performance on stage is of course essential, but not enough any longer. In many cases there is to much “protocol” – when to clap, when not, the stiff dress code, no drinks in the hall, starting promptly etc. Hole remembered that Mozart in a letter to his father had been enthusiastic about the audience clapping within the movement. Why is this banned in classical music today, but not in jazz? There should be much more different concert formats for different target groups in future. Hole saw many potentials to be developed such as connecting with audiences, video answers from the artist on questions from the audience, re-performances of commissioned music. ← British Orchestras – What’s next? While as a performer I’m quite happy for people to clap whenever they like, I’m not sure that’s what’s stopping people from coming to a concert. Jazz, the example given as being an exemplar to follow, isn’t exactly raking in the money or filling concert halls. The main issue, I believe, is education. If children never hear an orchestra or learn to play an orchestral instrument, they’re very unlikely to seek out orchestral music as they get older. Get children into the concert hall regularly, they will quickly realise that it’s fun and not have inhibitions about going to concerts later in life. ¡Oh, cómo disfruto cuando veo a mi público sollozar! Mr. Hole is right: I really would love to see the audience (a cultivated one) break into enthusiasm after a first, second or third movement. Mozart liked it, Berlioz too, and it was like that for three centuries.